In 2007, K Paul Stoller was told what no parent is ever prepared to hear: “Your son is dead.” Galen Stoller, an eleventh grader at Desert Academy in Santa Fe, New Mexico, was hit by a train at an unguarded railroad crossing. At the moment of impact, Galen enters another dimension, one in which he can see his grieving family and communicate with his father, a former pediatrician and fellow of the American College of Hyperbaric Medicine. Galen’s initial contact with his father is through a trance medium. K Paul had studied and worked with trance mediums in the 1970s and in the disbanded parapsychology lab at the UCLA Neuropsychiatric Institute. The first book of an anticipated series, K Paul says Galen asked him to be his scribe. 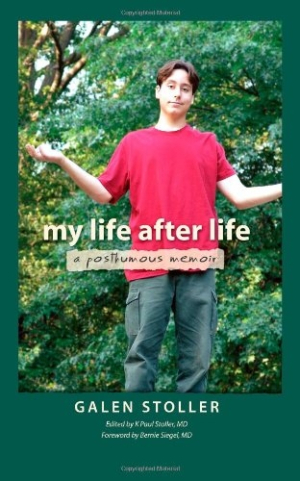 Galen’s efforts to describe what he sees and experiences are presented in this memoir, this effort to capture his life after death. K Paul’s reflections in the editor’s notes attached to each chapter are revealing and touching. This book will not only appeal to those who have longed to connect with a deceased love one, but also to those who simply want to know how to make the best of their time on earth.